Mazdak & Alborz design automation tries to fill the gaps in the ESL design flow by using SystemC language. We provide solutions for the following needs. :: A dedicated design environment for SystemC language. SystemC as a new emerging language provides software, hardware and system level design capability by using well-known C++ language. 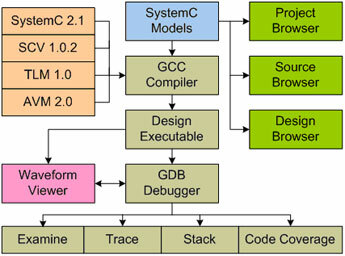 SystemC is a software language equipped with hardware and system design features. A true design environment for SystemC should provide all of the software, hardware and system level design features in an integrated environment. Evan is our answer to this requirement. Evan provides traditional software design environment features along with required features for hardware and system level designs. :: Reusing Verilog IP cores in SystemC design environment. SystemC, introduced as a next-generation system-level design language, models both hardware and software modules. It simulates the entire system in a unified language and environment, which highly accelerates system verification and presents designer an executable system model. But what to do with currently available IP cores? Most of them are in traditional HDLs such as Verilog. Should they all be designed from scratch again in SystemC? V2SC answers this question by bridging the gap between Verilog design environment and SystemC one.